In order for us at Laws Stained Glass Studios to give you estimated prices, we need accurate sizes. 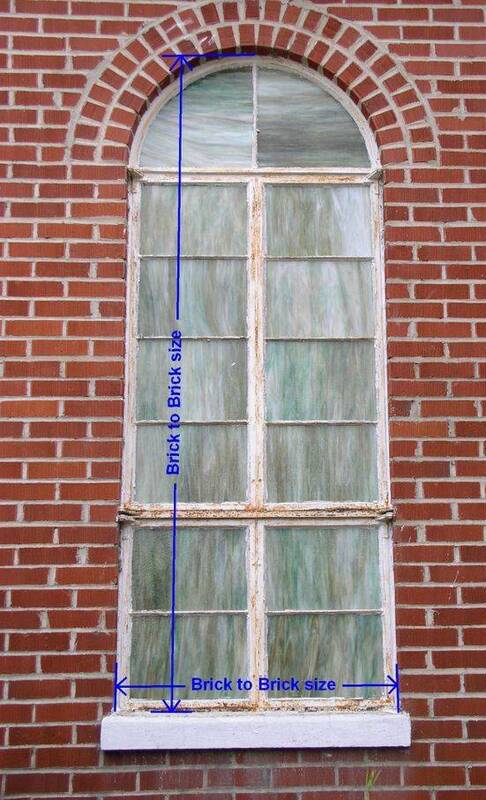 Below are photos showing where to measure your windows. If you have any further questions, please give us a call at 1-800-820-1292. This photo shows you where to measure if you have existing steel frames. Normally, we will remove the existing steel frames and install new extruded aluminum frames. Measure from the outside brick to brick, and we will be able to give you a good estimated price. This photo shows you where to measure if you have an existing wood frame. Most of the time, we will remove the existing wood sashes and install the stained glass window into the existing frame. On the outside, we may flash the exposed wood with aluminum flashing or just paint it. Measure inside the wood jamb for us to give you a good estimated price. This is another photo of an existing wood frame. Measure the overall size so that we can give you a good estimated price. Above is a photo of an existing aluminum frame wth an insulated glass unit. Sometimes, we install the new stained glass window to the inside of the existing aluminum frame. There are many different types of aluminum frames - each installation is different. But if you send a picture and measure inside the frame, we can give you accurate, estimated prices. For a large window like this, measure the overall size as indicated above. Do not worry about measuring all the individual sections.